The school was built in 1910/1911 to replace the first log building, which was built in 1895. This building was built by Israel Umbach at a cost of $750.00 and its first teacher was Cornelia Railey Wood. Interesting to note that the two most famous people from the area both had such a close connection to this building. Average annual salary for a teacher in 1912 was $720.00. In 1921, a 450lb bell was installed. The bell went missing between 1952 & 1954 after the school had closed. 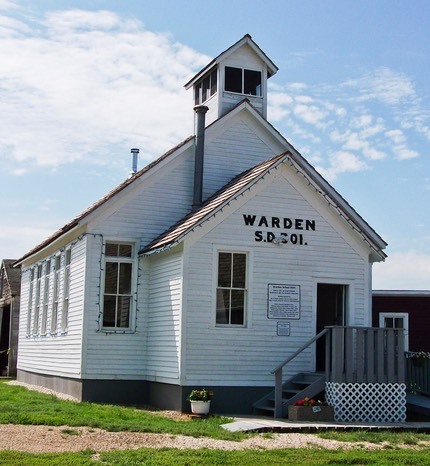 The school was moved to the museum grounds early in 2010 and eighteen months later it was repaired, restored displayed and ready for the public and we dedicated it in September of 2011. Some issues to be dealt with were lead based paint, a huge honey bee hive in the walls and 100 years of accumulated dirt. 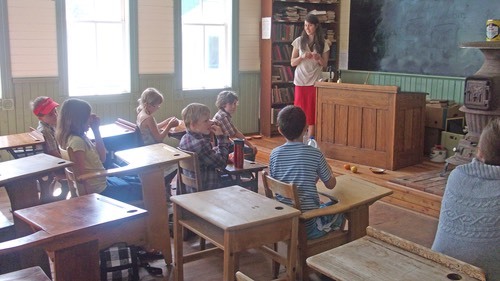 The museum could not afford the costs of removing the lead paint, so, after contacting the Canadian Conservation Institute, we sealed in the old paint and then painted over it using colours matching what was used in the school in the 1930s. This project is a real tribute to the dedication of our volunteers. They did an excellent job and we are very proud of them and our school.